During puberty, many young people see changes in their skin. These changes are because of testosterone (T) and other hormones that start being made at puberty. If your body doesn’t have much T or cannot react to T, your skin cells probably won’t make much oil and may only have a few pimples/spots. If your body can partially react to T and has a lot of it, your skin cells may mature a little bit, produce some oil, and have some pimples/spots. If your body can fully react to T and has a lot of it, your skin cells will probably mature fully, produce oil, and have pimples/spots. T is made by gonads but also by these things called adrenal glands (they sit on top of your kidneys). Even if you don’t have gonads, your body will produce a little T from the adrenal glands! But remember, not everybody can react to it. 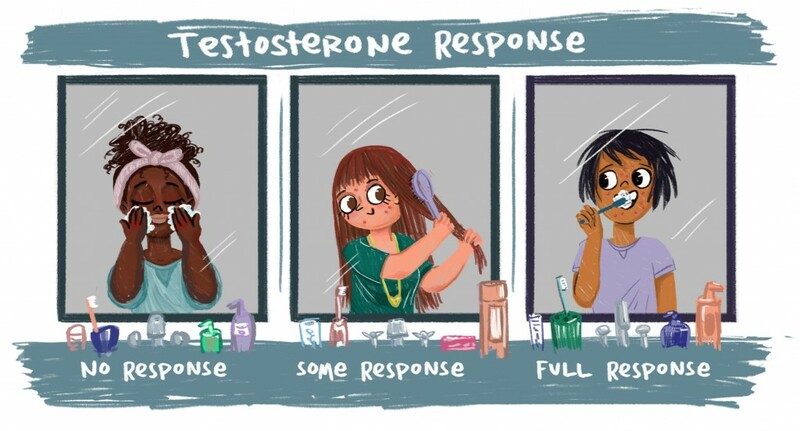 This explains why girls with ovaries have acne/pimples and some changes caused by T, too. Throughout the day our skin can get dirty from dirt in the air, and can burn from the sun (even on a cloudy day). It is important to bathe and take good care of our skin by putting on sunscreen.